Determined to keep your teeth shining bright? You already know how important it is to brush and floss daily, and to avoid smoking or chewing tobacco—and see a dentist periodically. 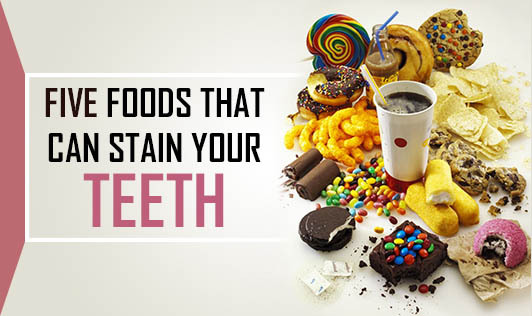 However, dentists also suggest you to be mindful of certain foods and beverages to prevent your teeth from staining. Here is a list of 5 such foods and beverages that will stain your teeth. Black Coffee-The darker the beverage, more the staining, this is because the outer layer of the tooth is very porous and absorbs the dark colored beverage causing the teeth to stain. By that, I don't mean to say one must stop drinking coffee altogether, but you can make a lighter coffee, add some milk to lighten it and do away with the harm. Milk will also help you with some amount of calcium and vitamin D, which will keep your teeth and bones strong. Tea- Tea contains tannins which stain the teeth. But tea also has many health benefits, so just like coffee, add a little milk to your tea. You can go for healthy varieties of green, white and herbal teas which are light in color and cause less staining. Red wine- Red wines may be good for your heart, but it doesn’t treat your teeth the same way. Studies suggest that both red and white wines have similar effects on your teeth, if taken in excess. Although red wine stains more, white wine stains because of its acidic composition, which tends to erode the tooth enamel making them more porous and easily stained. Cola- Dark sodas are the worst enemies of your teeth because of their staining color. The cold soda causes your teeth to contract and the phosphoric and citric acids erode the enamel making the teeth porous and more prone to staining. Balsamic Vinegar- This healthy salad dressing is an absolute favorite to many people. However, there’s a price to pay for sloshing this dark vinegar over your salad. Yes, you have guessed it right; being dark in color, balsamic vinegar can easily stain your teeth. Replace your dark colored vinegar with a lighter version or with lemon juice to avoid staining of teeth.